Music not only transcends the barriers of human language but also the barriers between humans and animals too. 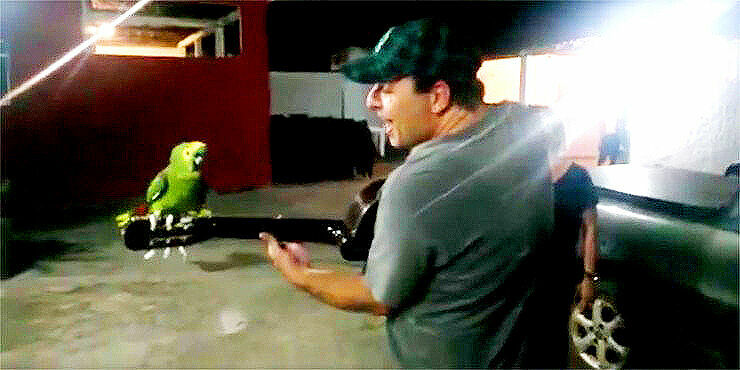 At least it does with this interspecies duet between a bright green Amazon parrot and a Brazilian guitarist. Perched on the end of the guitar awaiting its cue, the parrot and its human performing in unison was captured by Claudecir Silva from Brazil. And they make for an entirely entertaining and amusing pairing as they run through a medley of songs. The video is actually a year old but has floated to the top of the internet again after being posted to Reddit. It shows a musician singing in Portuguese and then his parrot companion giving his own interpretation, whistling even singing along, mimicking what the musician is strumming and singing. It's the kind of performance that would draw rapturous applause if it was on the stage of a talent show. It's also the kind of performance that has garnered over 11 millions views on Facebook. It's impressive stuff, the pair must have put in some serious practice. If you're wondering what the medley of songs is they're performing, according to the YouTube video it's Natiruts "Liberdade Pra Dentro da Cabeça," Cidade Negra "Onde Você Mora?," Tomate "Cuida de Mim," and Tim Maia "Vou Pedir pra Você Voltar."